Fillers used for correcting facial imperfections have been around since the late 1800’s. Augmenting the face with different mediums such as body fat, paraffin wax, petroleum jelly, silicone, and animal collagen have all been experimented with, yet produced unfavorable long-term results. Development of conditions like granuloma (a mass of granular tissue) from these mediums pushed researchers to look for safer, more effective alternatives. Today we have the safest, longest lasting, synthetic fillers available like Juvéderm (hyaluronic acid). Whats more, the type of filler is not the only part of the process that has improved. In the past doctors have looked at loss of volume and wrinkles in isolation – targeting the area alone and many times producing unwanted results like puffiness, bull-dog jowls, and too much volume, making the face look disproportionate. New techniques like anatomic filling have proved to be much more effective. Let’s take the example of sagging skin around the mouth and jowls. Looking at the facial structure and understanding where the skin began to lose its elasticity then targeting those areas. By using a filler like Juvéderm Voluma (a gel filler formulated for deep injection and volume) to fill in the cheeks, the skin is then lifted up, diminishing the laugh lines and tightening the skin around the mouth and chin. Kind of like a face-lift. The patient now has a more youthful look while also correcting the issues around the mouth and jowls. This technique can be applied to other areas of the face in a similar manor. Where else can I use filler? Fillers are now also designed for different areas of the face with different effects. Special formulations allow your doctor to treat fine lines, deep lines, loss of volume, thin lips, and even eye troughs, eliminating sunken dark eye circles! 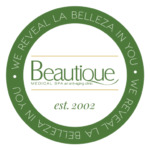 The JUVÉDERM family of dermal fillers has you covered and Beautique Medical Spa is highly trained and experienced to administer them. With the most advanced technology and modern formulations, your aesthetic goals are more achievable than ever.